Israelite, Nabatean and Roman period fortresses located near the spring of Hazeva, identified as Biblical Tamara and Roman Tamara. Ezekiel 47:19: "And the south side southward, from Tamar ". 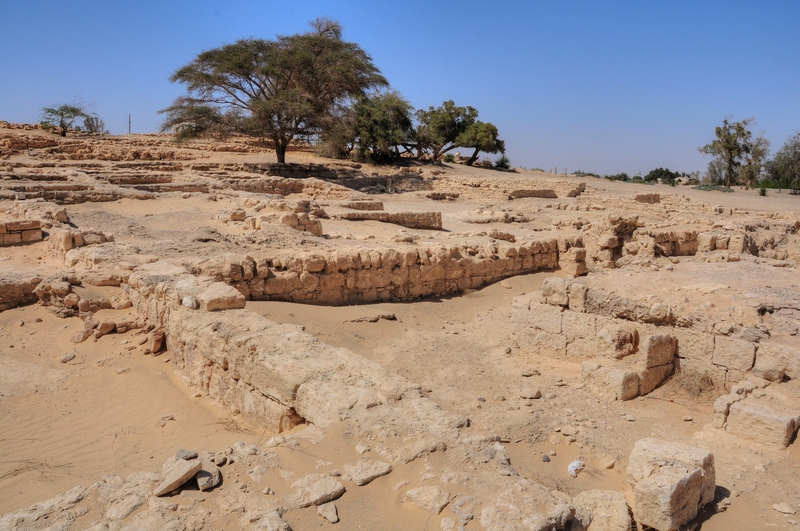 The oasis, identified as Biblical Tamar and Roman Tamara, is located in the Arabah valley. It receives its waters from the spring of Ein Hazeva. The frontier location, situated on the crossroads of major ancient routes, was a perfect place for a fortress and inn. 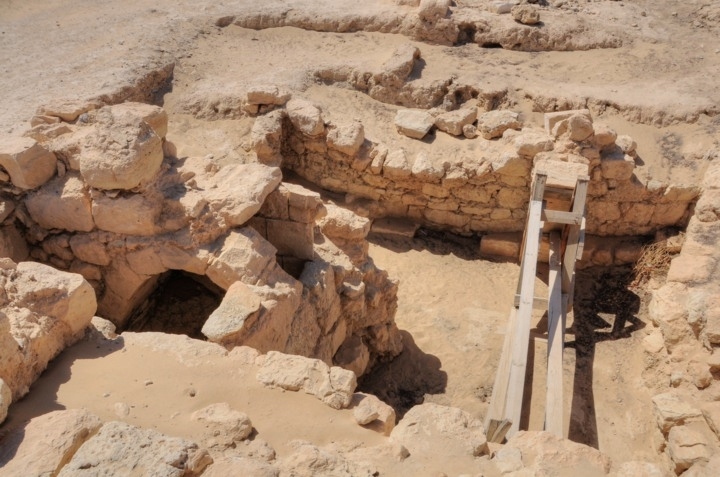 Archaeological excavations have reconstructed a number of fortresses and installations dated to the Israelite Kingdom, Nabatean, Roman and Early Arab periods. 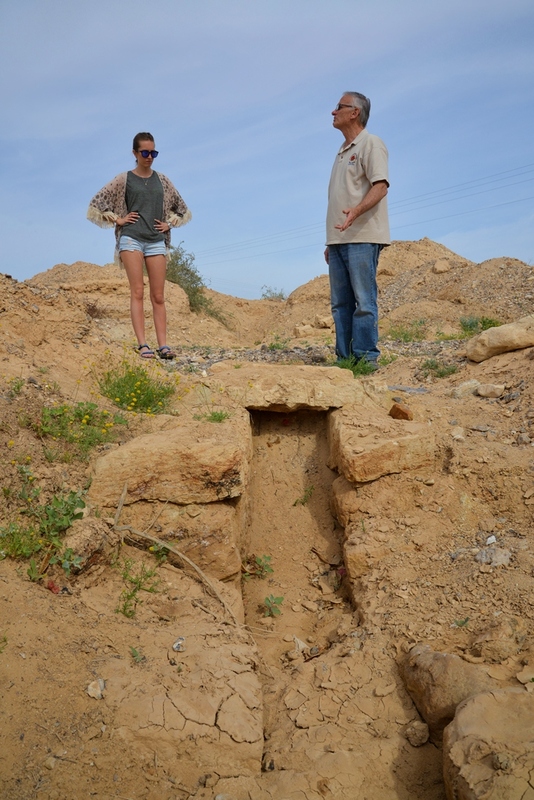 The site is located on the west side of road #90, near the junction of road #227 (to Ma'ale Akrabbim) and the road to Moshav Idan. 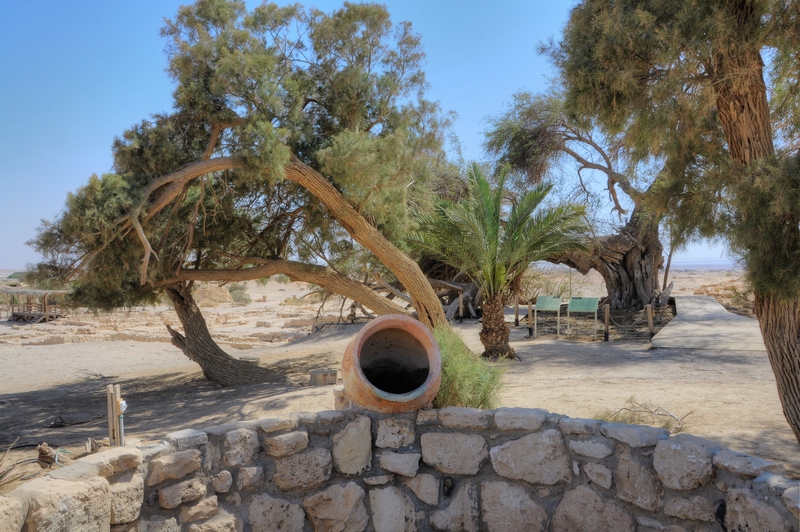 If traveling to Eilat along the Arabah road, you should take a one hour stop at the site. A Biblical map is illustrated below, with the possible location of Biblical Tamar (marked as "Tamar" in the bottom of the map). The site is located on the side of a route leading from the east, crossing the Arabah valley, then up to the center of Israel. The route then splits in the valley of Zin to two ascents - one through the Ascent of the Akrabbim (Scorpions), another through Nahal Hatira (Wadi el-Jemen or el-Hadire, a valley closer to the large crater). The two routes then join again north-east of the large crater (Hamakhtesh Hagadol), reaching Aroer which was a large fortified city during the Biblical period. Note that the modern road #227 follows the ancient route from Hazeva to the Akrabbim Ascent. In Ezekiel there is a description of the promised land, with Tamar on its south side (Ezekiel 47:19): "And the south side southward, from Tamar even to the waters of strife in Kadesh, the river to the great sea. And this is the south side southward". 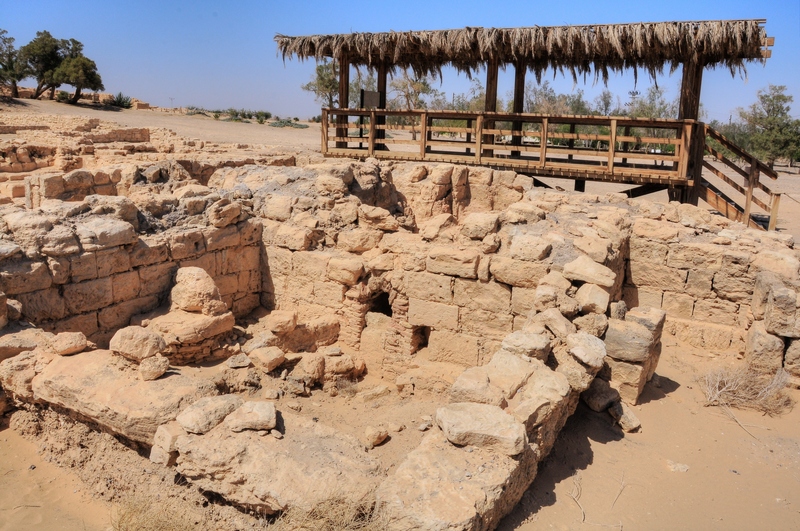 The strategic location of Tamar, and the availability of spring water, were the reasons that the Israelite kings built a fortress at this location. 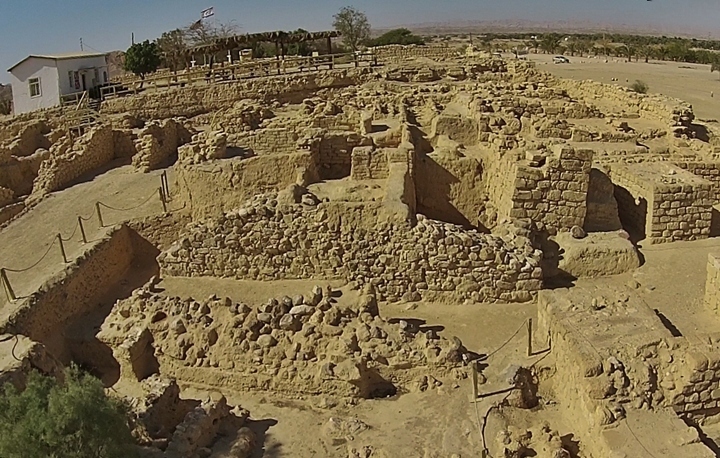 The earliest structure was dated to the 10th Century BC- the times of King Solomon. During his times the route was used to trade with southern kingdoms such as Ophir (Africa? ), Sheba and Arabia (as per 1 Kings 10). Traces of a square fortress was found in layer 8 near the city gate. Tamar is listed as one of the cities built by Solomon in the wilderness. Although it appears in the Bible as Tadmor, scholars suggest that it was actually the fortress at this site (1 Kings: 17-18): "And Solomon built Gezer, and Bethhoron the nether, And Baalath, and Tadmor in the wilderness, in the land". 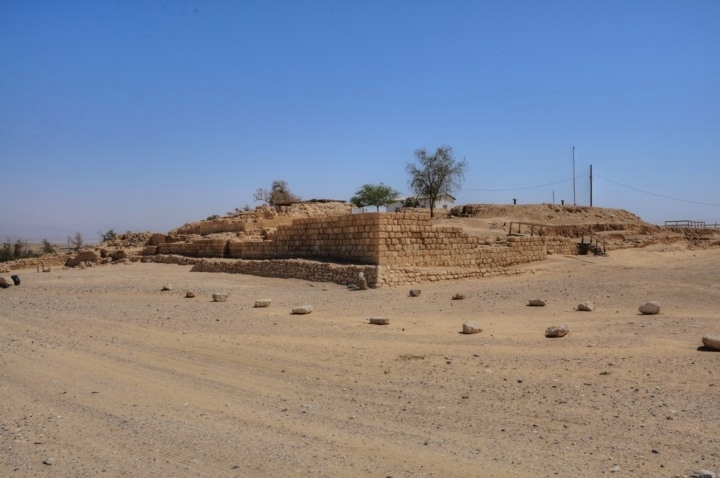 Recent theories suggest that Tamar was important for the Judean Kings in the 10th-9th Century as it was located near the source of copper mining, which was at that time in Funon (Wadi Feinan or Faynan), 30 KM south east of Tamar. Another but farther mining center was in Timna, 130km south. The copper mining industry, which reached a peak during this period, was an important source of income for Kings David and Solomon. It was perhaps a major factor of the Judean Kingdom's prosperity, and one of the commodities that Solomon traded with the southern kingdoms. 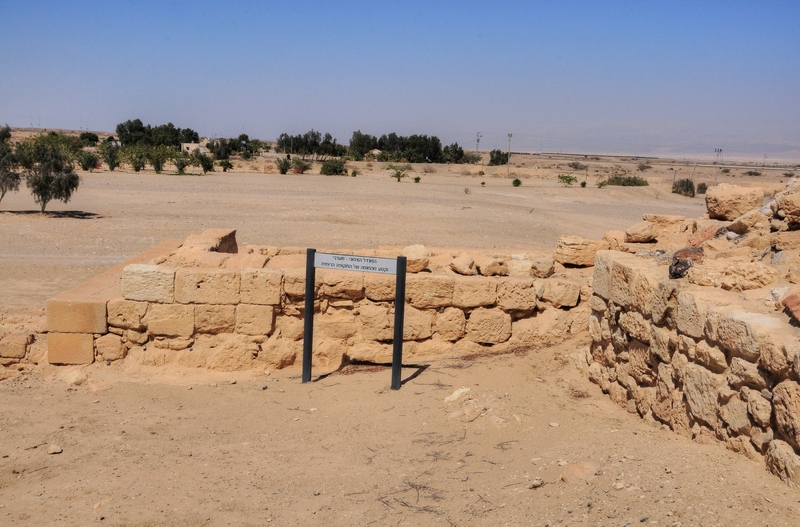 Tamar is located on the route from Funon to Judea, and therefore the fortress was constructed to safeguard the route. 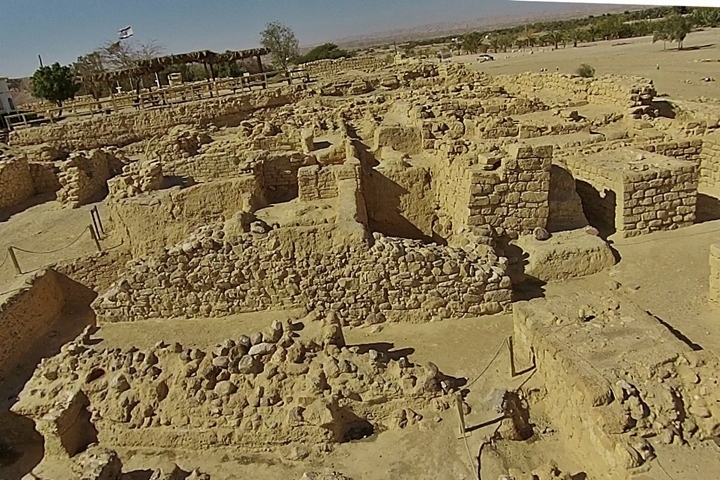 According to archaeologist Nelson Glueck this was one of the reasons why King David conquered Edom, where the copper mining center was located (1 Chronicles 18:13): "And he put garrisons in Edom; and all the Edomites became David's servants". During the 9th/8th Century a square 50m x 50m fortress was built above the Solomonic fortress. 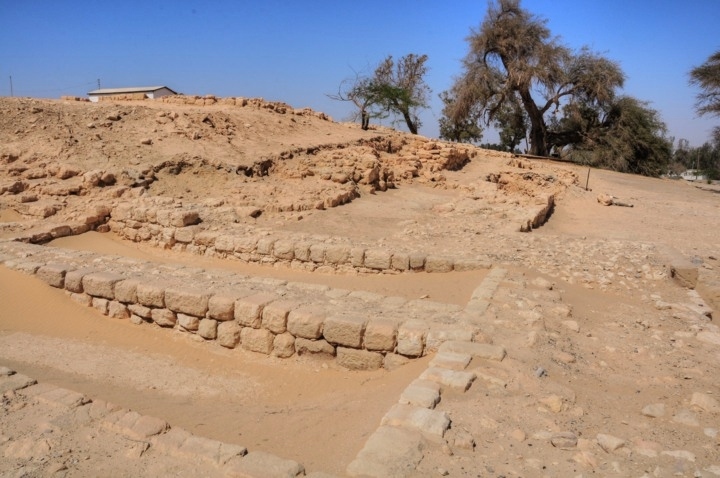 The site became an administrative center of the Judean Kingdom. Its ruins were identified in layer 7a. 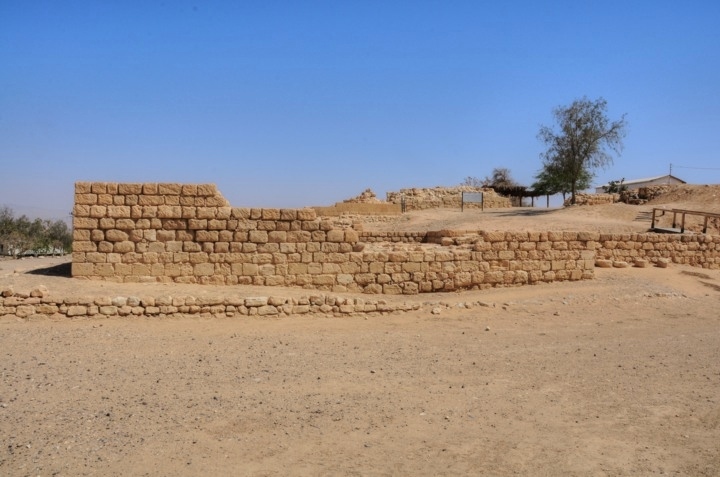 An immense fortress, four times larger than the previous fortress, was built during the 9th or 8th Century BC (Iron age II - the Israelite period). It included a casemate wall surrounding the large site (100m x 100m), 3 towers, and a four chambers gate on the north side. Sections of the fortress were reconstructed by the archaeologists on all sides of the mound (layer 7b). The fortress was destroyed and blazed following the Assyrian conquest by Sennacherib. 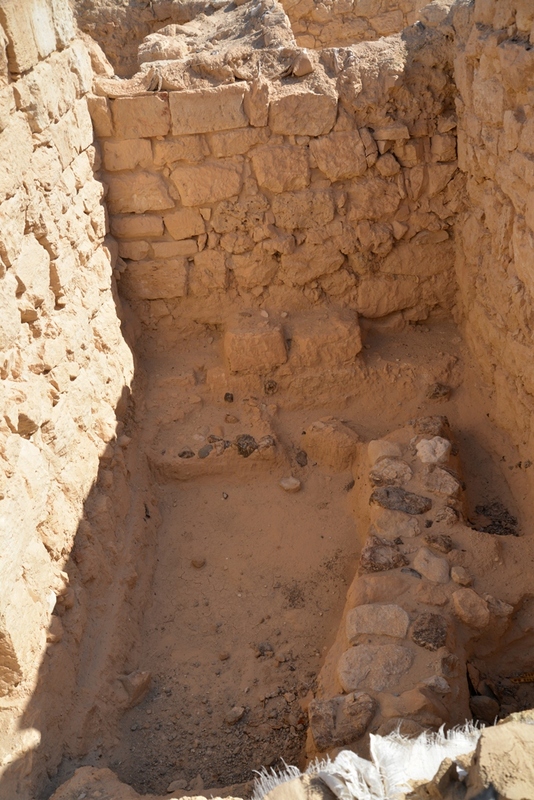 Remains of a four-room house, constructed outside the city walls, belongs to a later date (7th-6th Century BC, layer 6). During the 7th Century BC an Edomite shrine existed on the north side of the walls. The excavators found a unique assemblage of cult vessels, which were apparently shattered. The scholars suggested that the smashing and burial of the cult vessels was probably associated with the religious reforms of King Josiah. 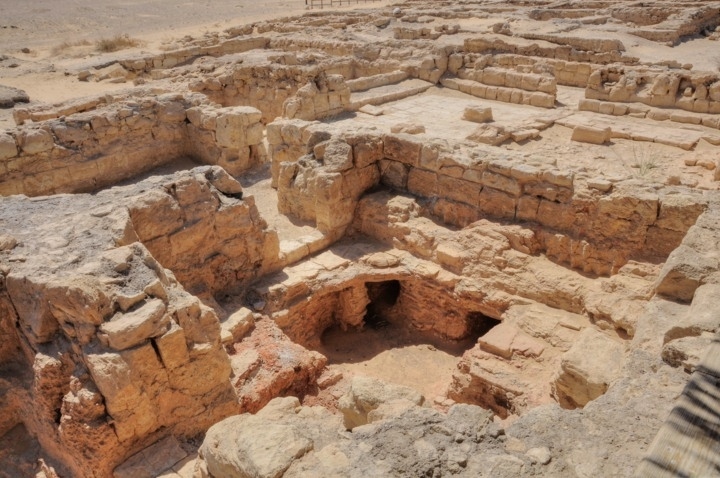 The Incense & Spice route connected the east (Yemen and Oman), through Arabia, via the Nabatean capital city Petra, to the port city of Gaza on the shore of the Mediterranean Sea. This road, with a total length of 2,400 km, passed through harsh desert areas. It was used by the Nabateans, from the 4th Century BC until the 2nd Century AD to export the incense and spices from southern Arabia and the Far east to the Classic world of Greece and Rome. Hazeva was one of the stations on the road from Petra, thru Ma'ale Akrabbim to Mamshit, and from there to the ports of the Mediterranean Sea and to the center and north of Israel. 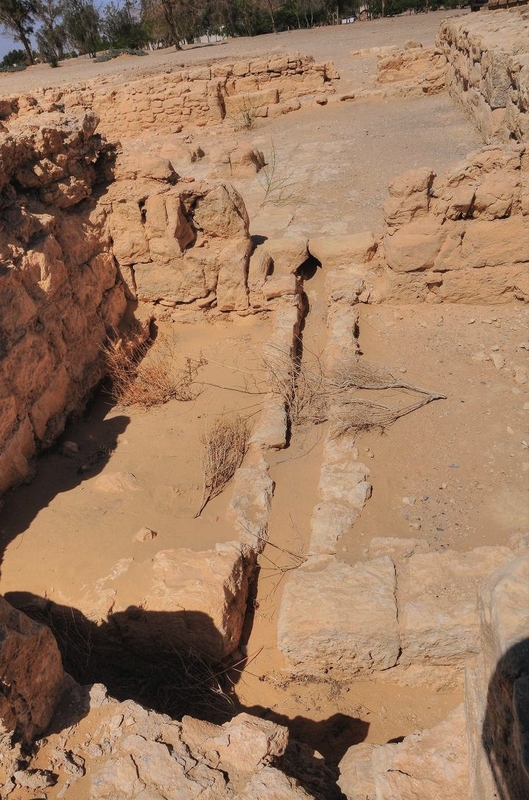 The archaeologists identified in layer 5 sections of a small Nabatean fortress, temple, and storage room under the ruins of the Roman fortress. In 106 AD the Romans annexed the Nabatean Kingdom. It became part of the defense and road systems of the Roman empire. 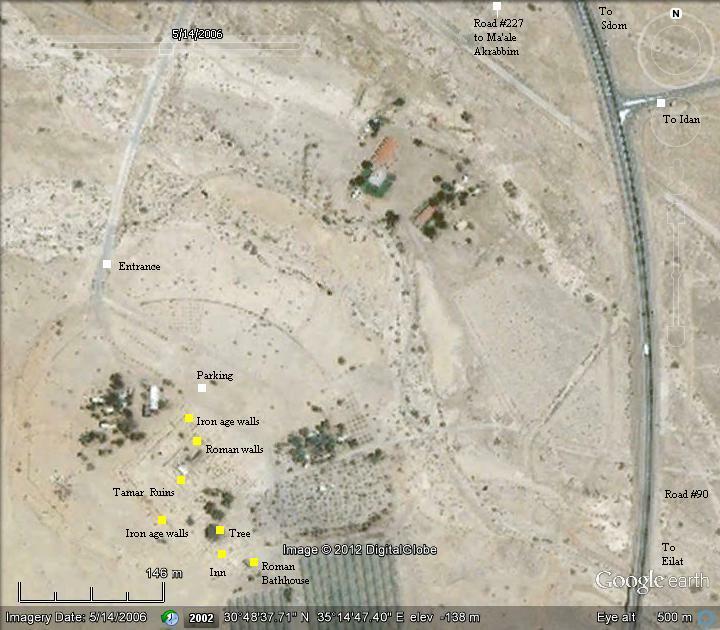 This site appears on the Peutinger map (based on a 4th C Roman military road map) as "Thamara" (marked by a red square) as a station on the road from Jerusalem to Eilat. Note that the orientation of the Roman map is north on the right side. The Incense route is not shown on the map, but this section was part it. Remains of this period of annexation were identified as layer 4, when a small two-floor fortress was constructed. The Romans constructed here a square fortress (46m x 46m) in the 2nd half of the 3rd Century AD. Four corner towers (7m x 8.5m), projected from the casemate walls, were added in the end of the 3rd Century, probably during the reign of Diocletian. A bathhouse complex and inn were constructed on the east side of the walled city. The fortress was destroyed by the 344 AD earthquake, and was rebuilt. In the earthquake of 363 AD, which destroyed Petra and all parts of Israel, the fortress was ruined and never rebuilt again. During this time Tamara was a small military outpost. Tamara is illustrated as an icon on the 6th C Madaba mosaic map, which was found on the floor of a Byzantine Church in Jordan. Above the icon is the Greek word "θΑΜΑΡΑ" (Thamara). The icon shows the two corner towers and the wall and gate between them. 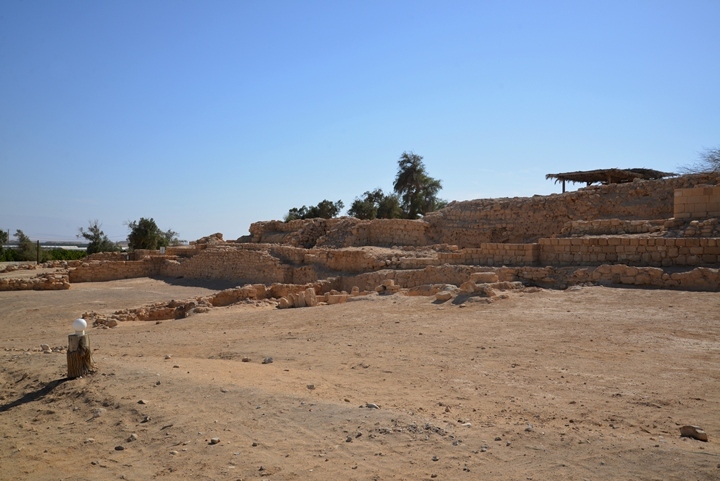 Note that an alternative site for Thamara is the Tamar fortress, located on the road from Sodom to Beersheba. 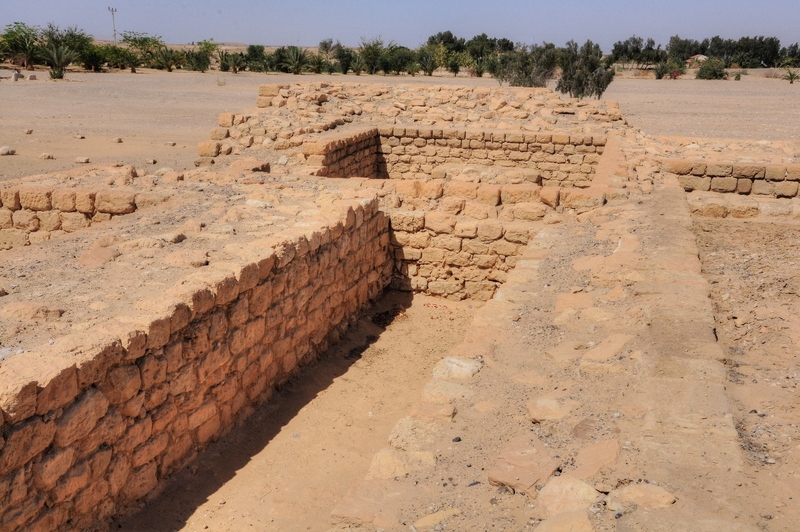 Tamar became an agriculture farm during the Early Islamic period (7th-9th Century AD). During the British mandate (1922-1948) a police station was constructed on the site. Remains of this fort, which was constructed in 1932, are evident by the aqueduct and the well on the north side and the building. The builders of the police station reused the stones of the ancient fortresses, causing damages to the antiquities. In 1967 a Kibbutz was established at the site. The settlers called it Ir Ovot, a Hebrew name menaing: "city of Oboth", which is named after a station of the Israelites during the exodus (Numbers 33 1,44): "These are the journeys of the children of Israel, which went forth out of the land of Egypt with their armies under the hand of Moses and Aaron....And they departed from Oboth". The exodus period station was located somewhere in the Arabah, and its was chosen for the new settlement. The Kibbutz, a communal settlement, lasted until the 1980s. Excavations were carried out in 1990-1994, directed by R. Cohen, Y. Israel and many others. 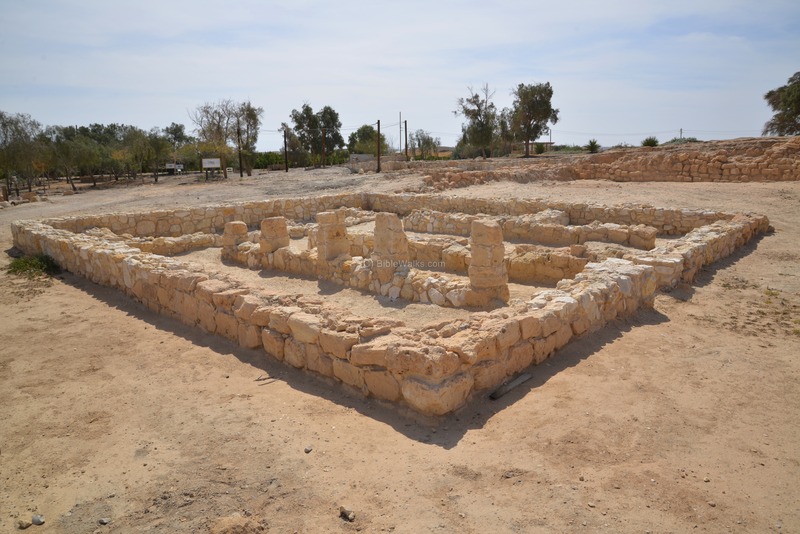 The excavations were financed by a philanthropic Christian organization Blossoming Rose, a group that still supports the ongoing excavations and operation of the park. Renewed excavations started in 2005. Today the site is open to the public. It is arranged and maintained in an excellent shape, and we recommend to stop here for a brief visit to the site. * Special note: On March1-2, 2016, our staff stayed on the site as guests of Blossoming Rose - the curator of Biblical Tamar park. We thank DeWayne and the staff of volunteers, a special type of dedicated people, on the warm welcome and hospitality. Thank to these wonderful people, the site has turned over the years from a pile of sand to an amazing archeological open air museum. We encourage our readers to support this project and visit the place. The excavators identified the various levels of the site, and marked them as Strata (level) 1-8, as summarized in the following table. 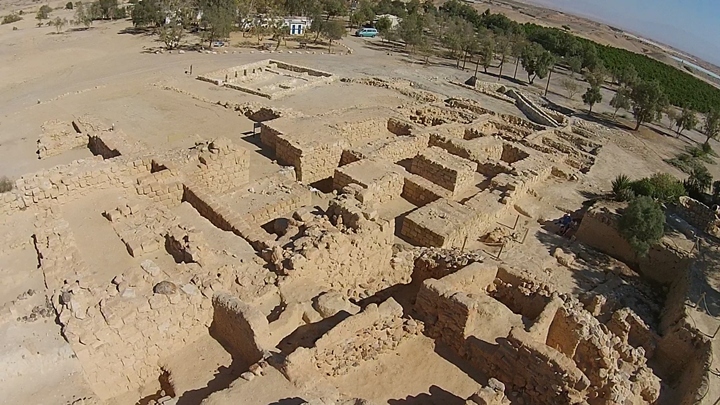 A drone captured a set of views of the archaeological park. This view shows the entire site from the north side. The next photo, with a view towards the east, shows the area of the Iron Age city gate complex and the north-east side of the site. Another view from this point, towards the west, shows sections of the Iron Age city in the foreground. The city gate is on its right side. A section of a wall of the Solomonic fortress is seen in the center. 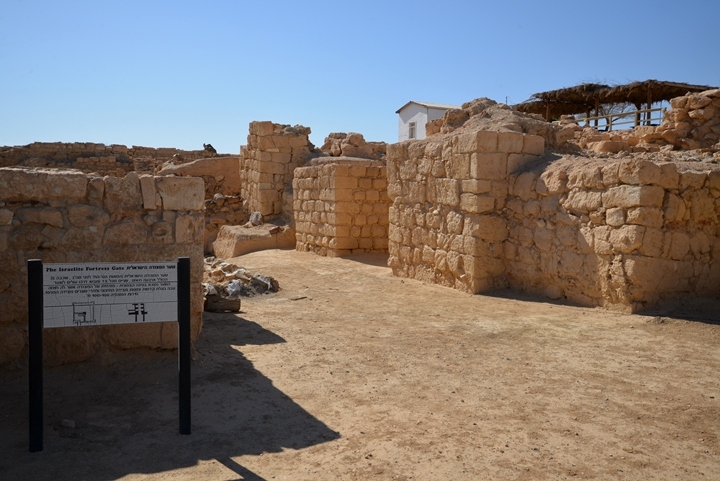 In the background, on the left, is the house of a British Mandate police station, while on the right are remains of the Roman fortress. Indeed - a mix of different periods. The following view, also towards the west, shows the central part of the ruins. The southern wall of the 9th/8th Century Iron age fortress, before its area was quadrupled, is seen at the line of the white house of the British police station. Before that wall are rows of rooms of the storehouse. During the 8th Century BC the Iron Age was extended to the west and to the south. The following view shows the southern extension. The south casemate walls, on the left side of the ruins, are 100m long. On the east side of the walled fortress is a Roman period bathhouse complex and inn. 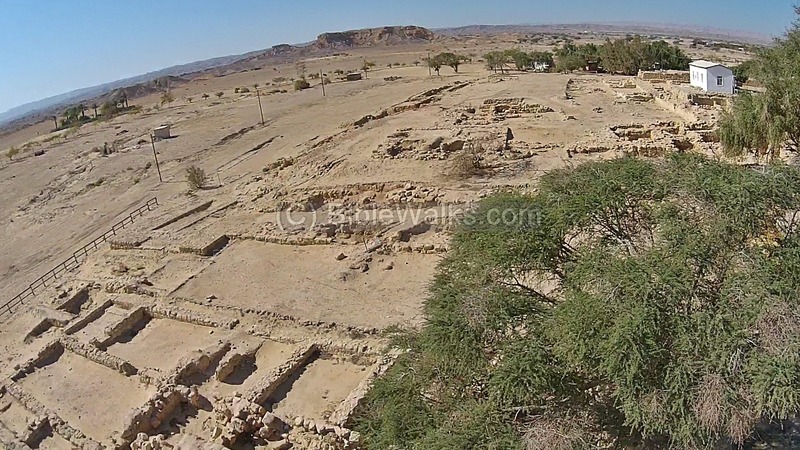 The following YouTube video shows a flight of a drone over the ruins of the Iron Age and Roman cities. It starts from the northern section of the city (with remains of the Iron Age and Roman periods), then flies over the eastern section (Roman inn and bathhouse). A view from the north west side of the site is seen in this photograph. 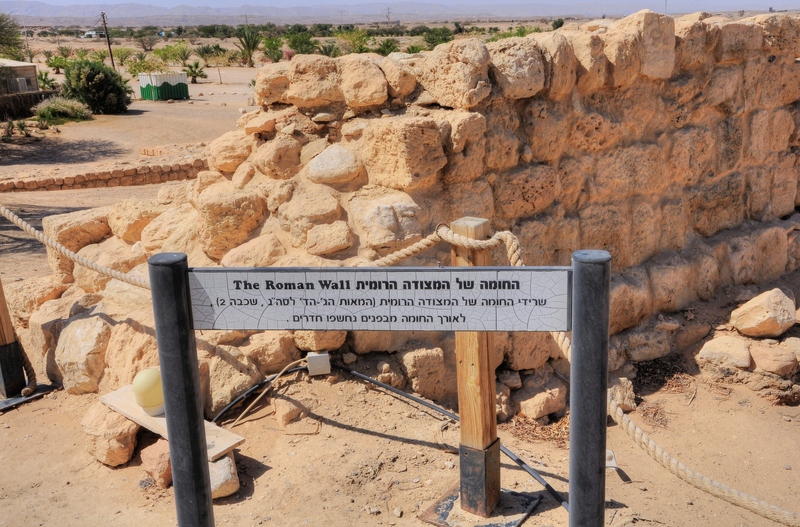 The external walls are dated to the Israelite period, while the remains of the Roman fortress are behind it on the hill. The gate to the city is located on the north, which is the left side of this view. All around the area is a very dry and hot desert. The spring of Hazeva, which is the source of life for the fortresses that were constructed here in antiquity, is located to the east (left) of the site. The following sections are arranged by the order of the layers - starting from the earliest layer (#8), then to the later periods (#1). As the archaeologists peeled one layer after another, it may be difficult to understand the plan of the cities throughout the ages. 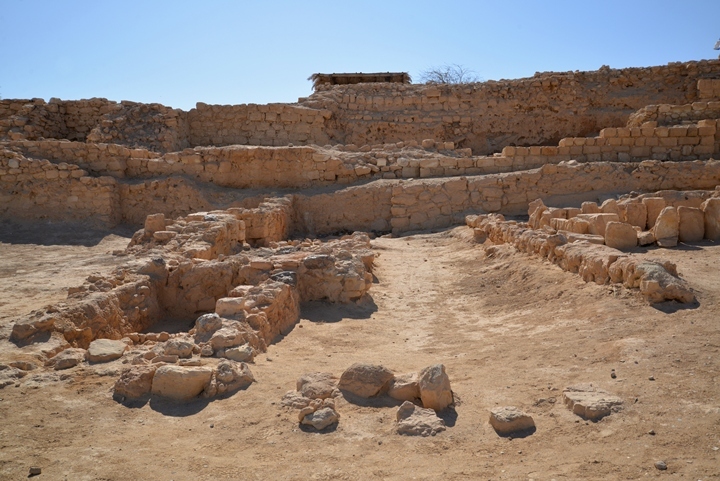 Traces of an early fortress, dated to the United Israelite Kingdom period (10th Century BC), were discovered under the city gate area of layer 7. The location of this early section is shown here in yellow. A section of the wall is seen here, on the south east side of the gate complex. 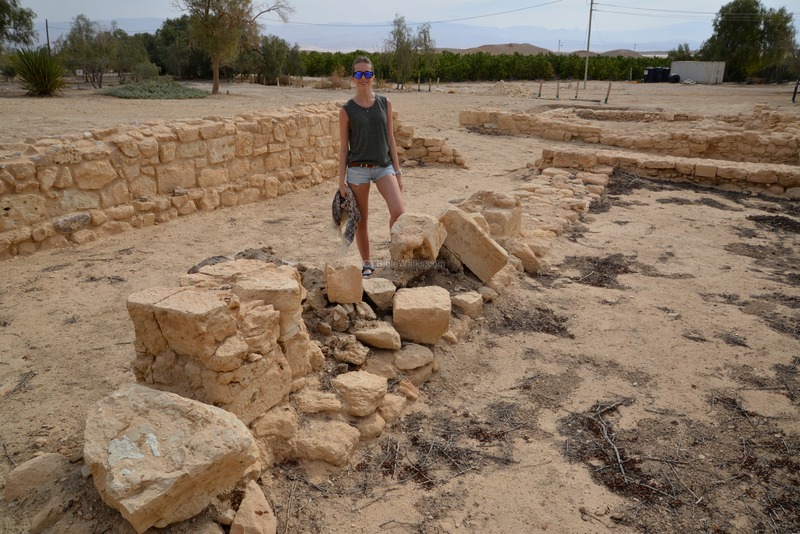 The excavators could not determine the exact plan of this earlier fortress, but speculate it was a square fortress (similar to other Negev Highland fortresses of this period), with rooms around a central courtyard (12 m x 11 m). It was most likely built during the reign of King Solomon, and destroyed after Solomon's death during the conquest of Pharaoh Shishak (~924 BC), after Solomon's death (1 Kings 14: 25: "in the fifth year of King Rehoboam, Shishak king of Egypt attacked Jerusalem". A large fortress was built on top of the Solomonic fortress during the 9th-8th Century BC (Iron age II - the Israelite period). The fortress is dated to the reign of Kings Jehoshaphat and Amaziah. During their times the Judean Kings attempted to control Edom on the southern border and to defend the road to the south. The fortress was a square 50m x 50m structure. It included a casemate wall surrounding the large site, and a four chambers gate on the north side. The area of the fortress is shown here in yellow. A view of the northern walls of the Iron Age city are seen in the next photo. The eastern area of this iron age complex is seen in the next picture. The complex included the city gate, silos, stables and store rooms. During the 8th Century the area of the fortress was quadrupled - from 50m x 50m to 100m x 100m. The external casemate wall was extended to the west and to the south. This construction of the immense fortress is attributed to the Kings Uzziah or Jotham. The area of this extended fortress is shown here in yellow. On the northern section of the city was an impressive four chambers gate, built of well dressed stones, and preserved to 3m height. A paved ramp leads up from the external side into the gate. The width of the gate was 4.8m on the outer side, while it narrowed down to 4m between the piers inside the gate. The western section of the gate can be seen on the right side of the picture below. The four-chambered gate is typical of many of the Iron Age II cities. Each chamber is 2.4m wide. The first chamber of the eastern side of the gate is seen in the next photo. The archaeologists excavated under the floor of this chamber in the attempt to find earlier periods. On the southwestern corner of the gate complex was a three room storehouse, and near it were two grain silos with remains of wheat and barley grains. The next photo is external view of this north-west corner tower. The tower projected 3m above the casemate wall. A moat and glacis was cut around the walls, and its earth was used to fill the structures. Pottery of the 7th-6th Century BC was found on the floors of the towers. The Iron age fortress extends to the western side of the Roman inn complex. Sections of its casemate walls are seen below. 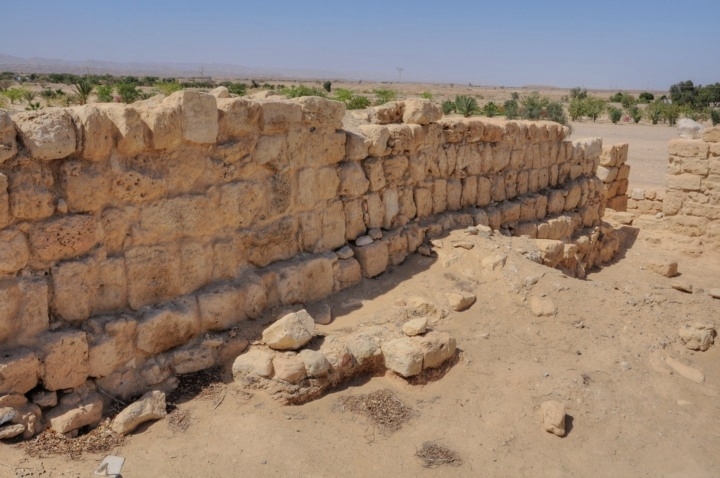 The city was burnt at the end of the 8th Century, probably during the reign of Hezekiah, when the Assyrians headed by Sennacherib destroyed many cities in Judea. A layer of ash was found in several rooms, including a number of several arrow heads. A sacred shrine and four-room house, dated to the 7th-6th century BC, were unearthed on the north side of the fortress. Their location is indicated on the following illustration in yellow. Outside of the fortified city, on the west side of the ramp leading up to the gate complex, stood a sacred shrine. 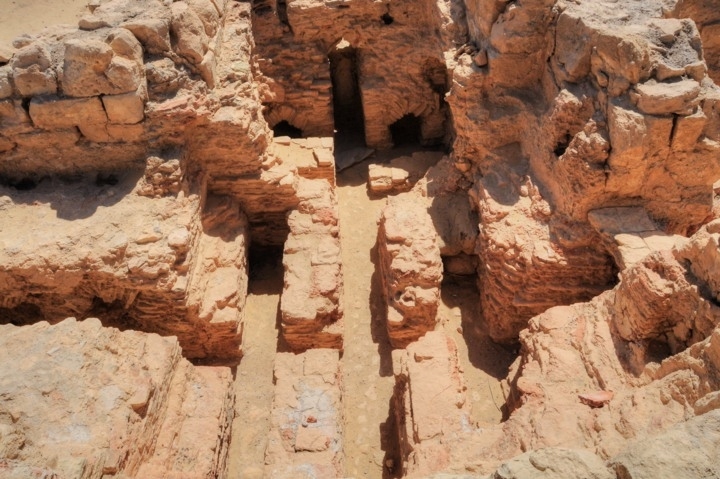 Inside the shrine the archaeologists identified 6 phases, ranging from the Iron Age to the Nabatean period. On one of the phases they found smashed incense burners and cult objects, an act of destruction they attributed to King Josiah which the Bible described as his religious reforms. Another structure, on the east side of the ramp and also outside the walled city, was identified as a four-room house - a typical plan found in Iron Age II residential structures in Israel. The photo below shows the base of this structure outside of the city gate, while the aerial view on the right shows the layout of the house. After the Babylonian destruction (587 BC), the city was abandoned. It was rebuilt only 500 years later. The excavators found remains dated to the Nabatean period (1st Century BC to 1st Century AD) under the Roman fortress. 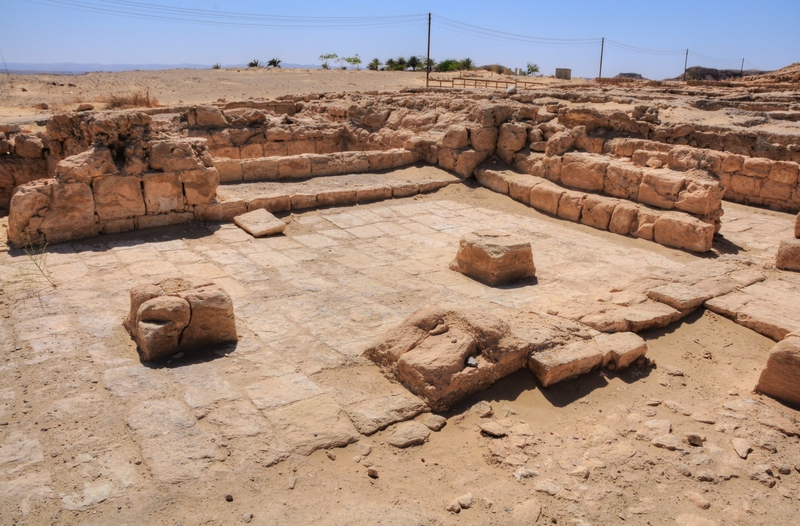 The Nabatean building included a small fortress and a temple. 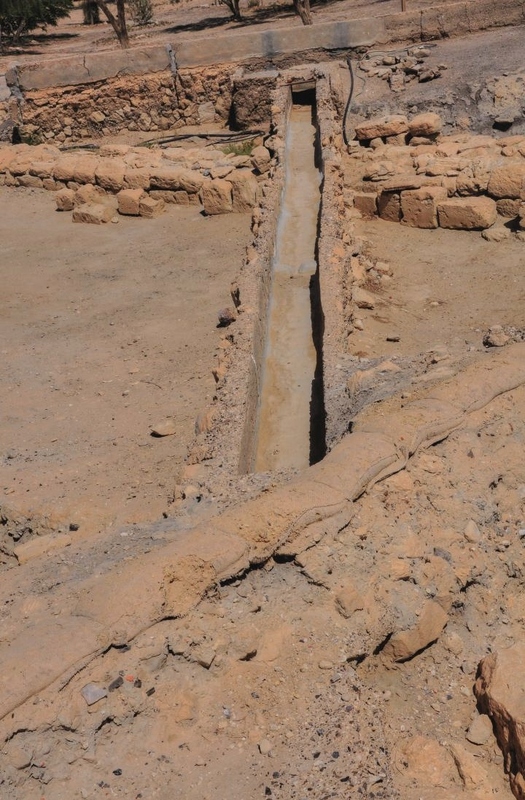 It was part of the stations that the Nabateans constructed along their Incense route. In the late Roman period, 3rd-4th Century AD, a fortress was built above the north side of the Iron Age fortresses. 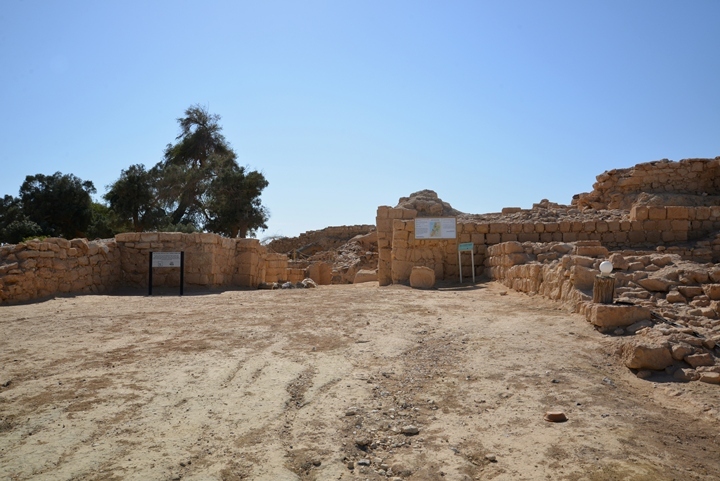 A caravanserai (inn) and a bathhouse were located to the east of the fortress. This is layer 3, and its location is marked in the following illustration in yellow. Earlier sections (layer 4), dated to 2nd-3rd Century, were identified south of the fortress. The Roman fortress protected the roads and the frontier of the Roman empire. 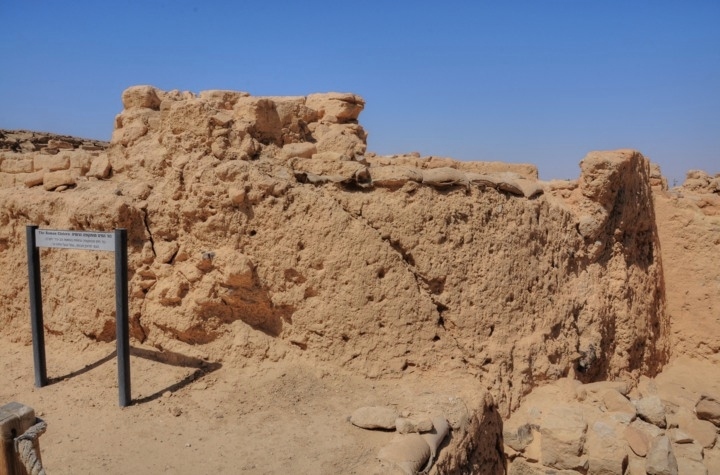 It was part of a series of Roman posts along the Arabah route that guarded the south eastern frontier. Another example of such fortresses is found in Yotvata, which has a similar design. The structure of the fortress is based on a typical prototype Roman design. Its size is 46m by 46m, which is bigger than Yotvata's plan (34m x 33m). Four towers are located on each corner of the fortress, each 7.0m by 8.5m, projecting 3m from the walls. Remains of the Roman fortress walls, dated to the 3rd-4th Century AD, are located on the western side. Below - another section of this wall. Rooms were aligned along the inner side of the wall. The fortress was built in two phases. In the first phase (2nd-3rd Century AD) the fortress stood without towers. In the second phase (3rd-4th Century AD) four corner towers were added, extending out of the fortress area by 4m. The north-west tower of the Roman fortress is seen in the next photo, with a section of the Roman wall. A Roman period cistern, dated to the 2nd-4th Century AD, is located on the eastern side above the ancient layers. The cistern is round, its walls are covered with stones, and has a narrow opening. The Roman bathhouse is located 50m south east of the fortress. This was a Roman military bathhouse, dated to the late Roman period (3rd-4th Century AD). Like the fortress, it was built in 2 phases. 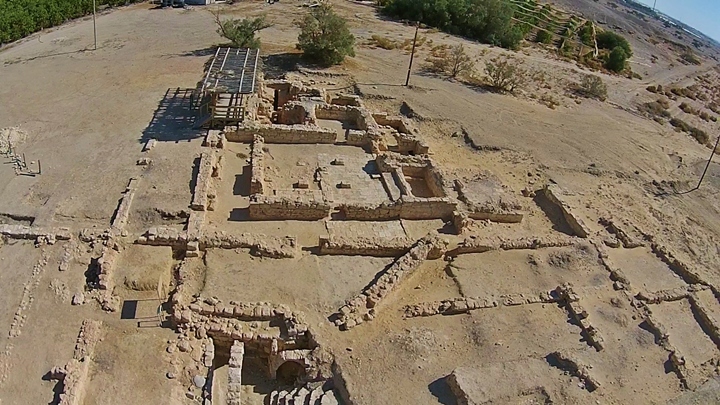 An aerial view of the bathhouse complex is shown here, with a view from the west side. In the next ground picture is a observation platform located on the northeast side of the bathhouse. 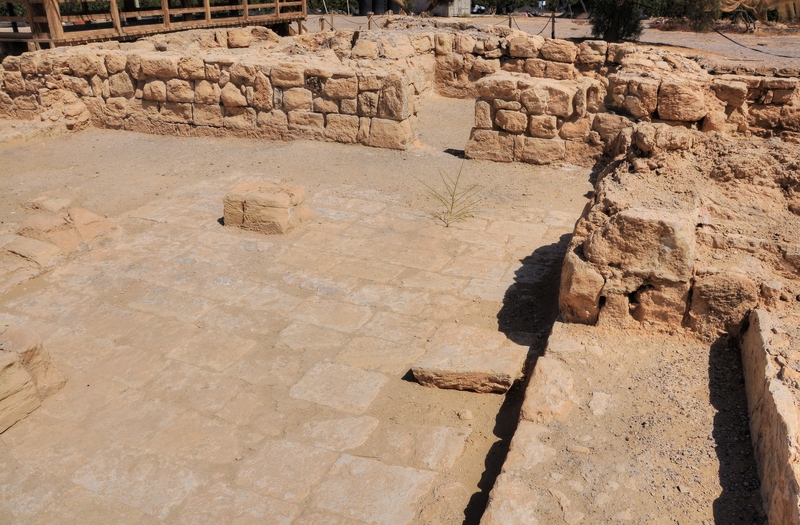 Remains of a caravanserai (inn) is seen just behind the walls of the bathhouse on the center of the left side. 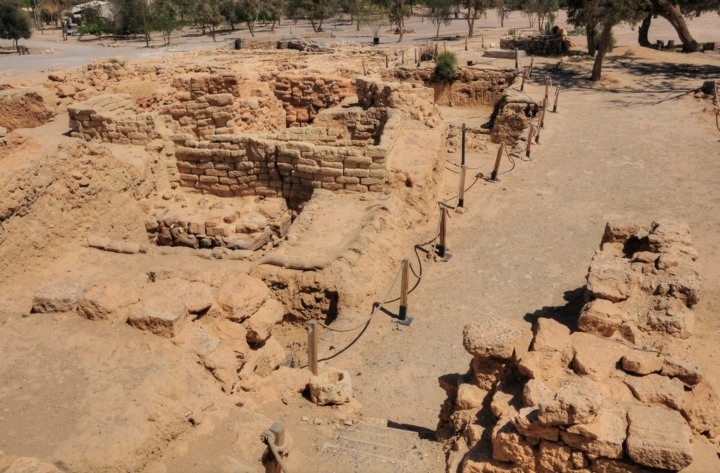 The bathhouse contained several rooms, based on the common architecture of the Roman bathhouse. The western room was an apodyterium—a room just inside the entrance where the bather stored his clothes. This was partially roofed, with a set of benches aligned along its walls. A view from the dressing room towards the bathhouse on the east is seen below. A number of stairs led the bather from the dressing room to the tepidarium (warm room). A nearby room included two bathtubs - with cold and hot water. A nearby room was a sudatorium - a vaulted sweating-room. The tepidarium (warm room) is where the bathers sat or lied on the floor. In this room they also received massages with oil and scraping with metal implements after the bath. The eastern room was the caldarium (hot room). A brick based stove warmed the waters inside the bath, using the Hypocaust method. This was an under floor heating system, based on hot air which was pumped under the floor and heated the waters. On one side of the room was a furnace, built on layers of bricks and mortar. The furnace heated the bronze vessel with water, producing steam. A high chimney, based on bricks and mortar, let the smoke out of the room. During our visit on March 2016 the Blossoming Rose staff was working on conservation of the bathhouse. 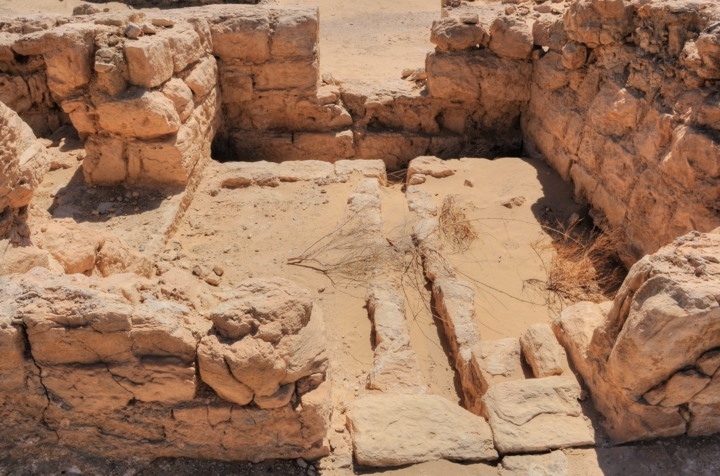 On the west side of the bathhouse are traces of structures dated to the Roman Period. The area is 57m by 39m, and is composed of many rooms located around a central courtyard (20m x 17m). This complex may have been a Caravanserai (inn). It could also have served as a palaestra (wrestling school room), which was often joined with a bathhouse in the Roman world. The next picture is an eastern view of the complex, with the courtyard in the center and the edge of the bathhouse on the right side. On the north west side of the caravanserai was a stable. It contained a place for a number of horses or camels, arranged with two wings, with a feeding trough in the middle. (See a similar stable in Mamshit). Recent excavations (2015) have unearthed a section of a Roman period aqueduct in the fields 300m north of the site. Initially it was assumed that the aqueduct was connected to the spring near the fortress, whose exact location is yet unknown. However, it was later determined that the water source for this aqueduct was at this location, and it conveyed the water outwards. Therefore, the function of the water supply was to water the agriculture fields north of Tamar. In the photo - DeWayne Coxon, President of Blossoming Rose, describing the aqueduct to Amit of BibleWalks. 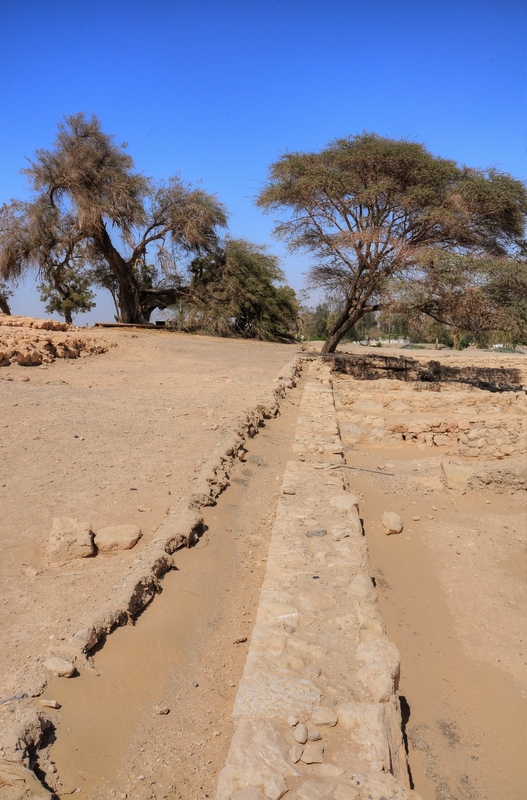 A British mandate period aqueduct and water trough is located on the north-east side. Their pump brought the waters from the spring to the police station and supplied drinking water to the camels and passengers on this desert road. A well is located at the end of the aqueduct. The British constructed a water trough for the camels. An enormous ancient Jujube tree (Latin: Ziziphus Spina-Christi, or: "Christ Thorn") grows here. 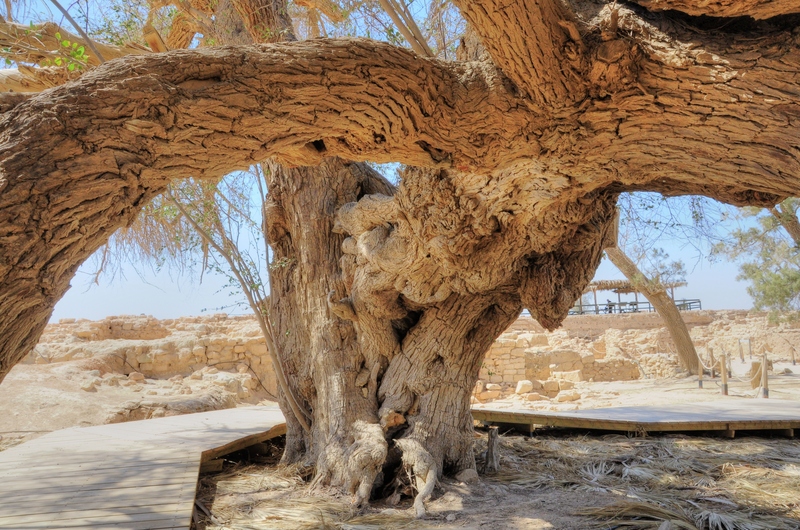 Confirmed by Avishai Shmida, Professor of Botany of the Hebrew University of Jerusalem, this is the oldest tree in the Holy Land, with an estimated age of 1,500-2,000 years. Its trunk (seen below) is 4.5m wide, its height is 15m, and it covers a diameter of 15m. 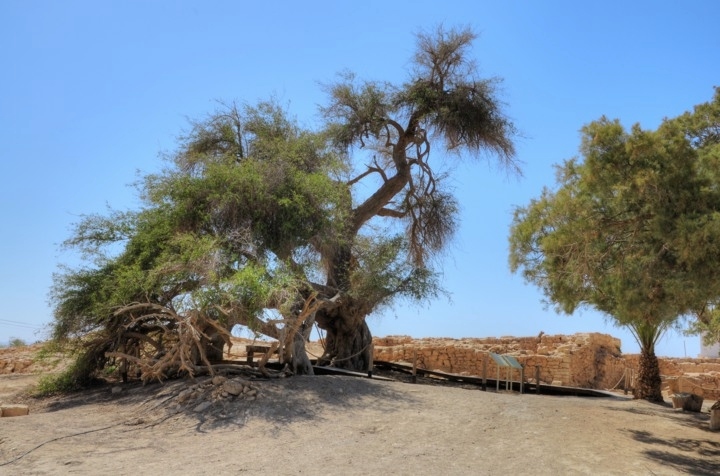 The tree existed here since the Roman period, and survived in this harsh climate thanks to the water supply from the spring. 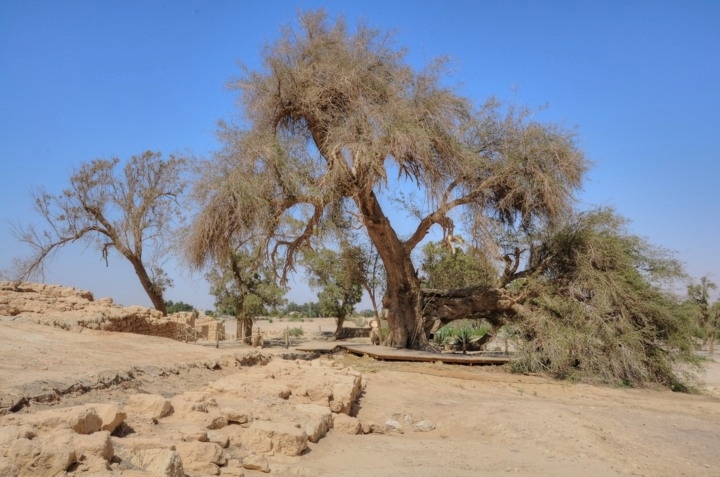 The common name of this tree, Christ Thorn, is based on the tradition of the type of tree branches which the Romans placed on Jesus head in order to torture and scourn him on his last journey (Matthew 27: 29): "And when they had platted a crown of thorns, they put it upon his head...". Hazeva - A Hebrew form of the Byzantine name of the site - EICEIBIUN. The word Hazeva is based on the Hebrew root for drill, and appears in the Bible meaning "hewn" (Poverbs 9,1): "Wisdom hath builded her house, she hath hewn out her seven pillars". Ayn Huzb - Name of Ein Hazeva in Arabic, means: fertile spring. Ir Ovot - Hebrew: "city of Oboth" - named after a station of the Israelites during the exodus (Numbers 33 44): "These are the journeys of the children of Israel, which went forth out of the land of Egypt with their armies under the hand of Moses and Aaron....And they departed from Oboth". Its location was somewhere in the Arabah. The settlers of the Kibbutz, established in 1967, named their site after this place. Tamar - Hebrew: palm, date. Edom - did it extend west of Arabah?